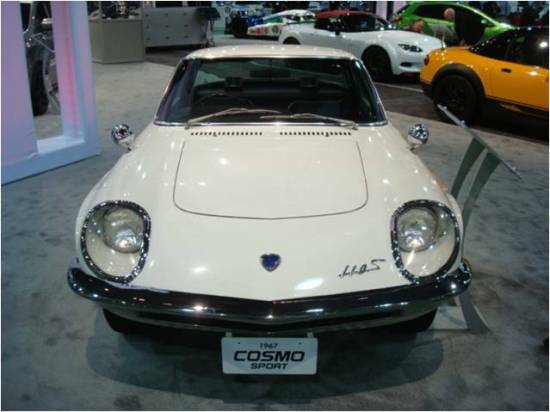 SEMA & EECMM 2011 – Mazda Events and Car Shows East to West! 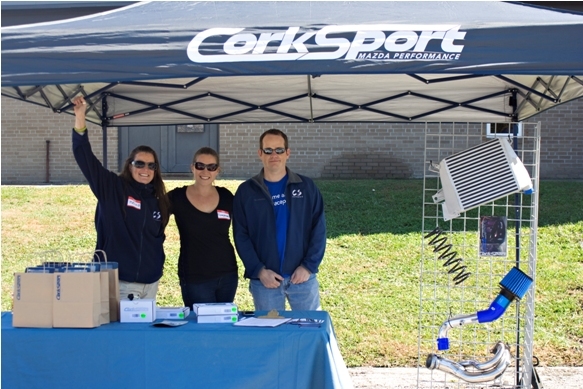 The CorkSport team has been on the road this week first sponsoring and attending the 5th annual EECMM (Epic East Coast Mazda Meet) held in Robbinsville, NC (think Tail of the Dragon) and then onto Las Vegas for the SEMA (specialty Equipment Market Association) show where more than 100,000 attendees and 2000 exhibitors met for four days at the largest annual automotive gathering and car show. Appropriately named, EECMM was truly an epic event. Mazda enthusiasts from all over the east met up in Robbinsville, NC for five full days of cruising stretches of the famous Hwy 129, deals gap, a car show with awards and plenty of raffle prizes and evenings of BBQ’s and parties at the smoky mountain mansion with no shortage of good times had by all. If you are not already familiar, the Tail of the Dragon is an 11 mile stretch with 318 curves and is America’s number one sports car road. The nearby Cherohala Skyway is another 60 miles of scenic mountain highway for the driving enthusiast to enjoy a more leisurely ride with it’s long, sweeping corners and scenic views. CorkSport spent Saturday with the Epic crew. 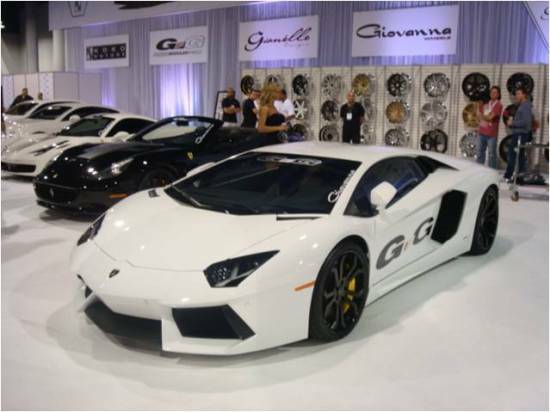 The car show featured about 60 cars and CorkSport was on hand with giveaways for the all of the attendees. Following the show the group went out for a ride on the Tail of the Dragon run while CorkSport prepared back at the mansion for a focus group. We then sat down with a group of customers and got the unique opportunity to gain feedback on what we are doing that works and what we can do to improve our products and services for the Mazda community. We stayed for some of the evening’s festivities, but had to run so we could catch an early flight out and onto Las Vegas the following morning. What a great group of people and awesome event! If you haven’t made it to EECMM yet, you need to go! Keep posted on 2012’s event and stay connected on the EECMM facebook page. Back to the other side of the country, SEMA kicked off on Monday. 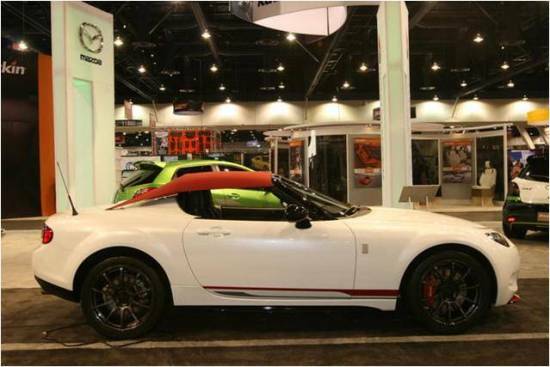 Mazda had the MX-5 Spyder on display at this year’s show. This Lighterweight version of the Miata ditches the heavier retractable roof and in its place had a single-panel bikini soft top made by Haartz. Weight savings came in other forms as well with a light weight lithium ion racing battery and light weight Advan RS wheels. It got a the 2.0 liter 4-cylinder turbo enabled biofuel engine which promotes the greener direction Mazda is moving in. As promised, the concept Mazda 2 turbo was also on display at the show with a Speed3 263-horsepwer turbocharged, direct-injected MZR 2.3 Liter engine under the hood. The body gets a track-ready look, thanks to a body kit, some ground effects and the Sonic White tri-coat paint job with a black and green accents. Also included on the concept car were HR coilovers, CorkSport Mazda 2 Sway Bars, CorkSport front tower brace, CorkSport rear chassis brace, CorkSport rear torsion bar, a modified CorkSport SRI from a Mazdaspeed 3 and Yokohama Neova 215/40/17 tires with OZ racing wheels. 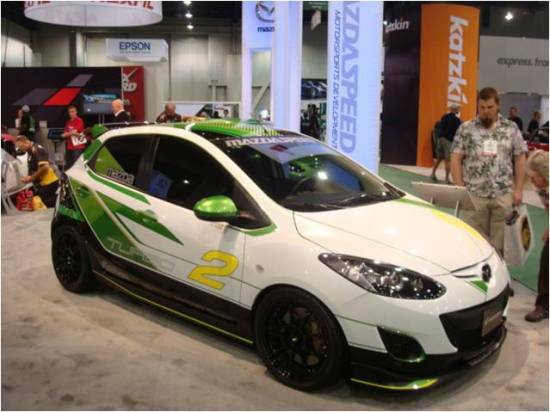 If you can’t wait for the Mazdaspeed2 to go into full production, the concept car built by Autobarn for the one lap of America race is available for purchase for an astounding ticket price of $94,999. The booth also had a slightly less modded Mazda2 tuned by 3dCarbon, a MX-5 Super 20 custom and a classic Cosmo on display. Flat-finished paint was all the rage at this year’s show and was embraced by hotrods and custom cars alike. The level of flatness/gloss ranged in scale from matte to reduced sheen and was available in every color from pearl white to bright orange. There was a lot to be seen at this show. It could not possibly all be covered in this post, but an honorable mention extends to the new Lamborghini LP700-4 Aventador in the Pirelli booth. It has a v12 engine and can achieve 700 HP and top speeds of 270 mph. It was hard to resist falling in love with it! The show continues today with Derrick still in attendance who I am sure will follow this post with some thoughts of his own from the show. It’s been a long week, but it is always great to get out and and get to know our customers better, put faces to names, and find out what’s going on in the community. When is the EWCMM (Epic West Coast Mazda Meet) gonna happen? Northern California or Oregon Coast sounds like a great meet place. Previous PostPrevious Mazda TAKERI – The Next Mazda6?